It is no secret I am a huge George R. R. Martin fan. 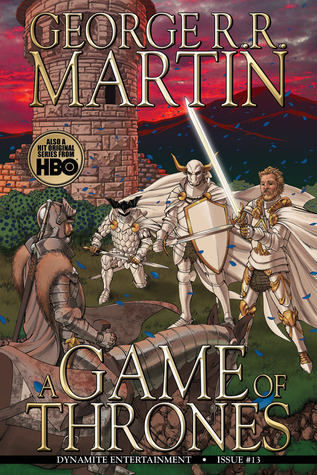 A Song of Ice and Fire with its layers of hidden mysteries, plots twists and characters is one of my favorite obsessions; first the book, then the TV show. I am often called on to answer questions for my father and engage in deep analysis with some of my coworkers. One area that I’m also a fan of is the comic book. I’ve always loved great art and these two are wonderful. Ken Macklin never really seemed to get the fame I thought he was due. This page found its way into my collection over 25 years ago and it is one I won’t part with. His ability with shading, composition and making animals interesting, without being cloyingly cute are things I’ve always loved. He’s an artist you might have missed, but shouldn’t have. Ted McKeever, on the other hand, brings the deranged to life. I loved the work he did on Eddy Current. Who would not love the exploits of an escaped mental patient? 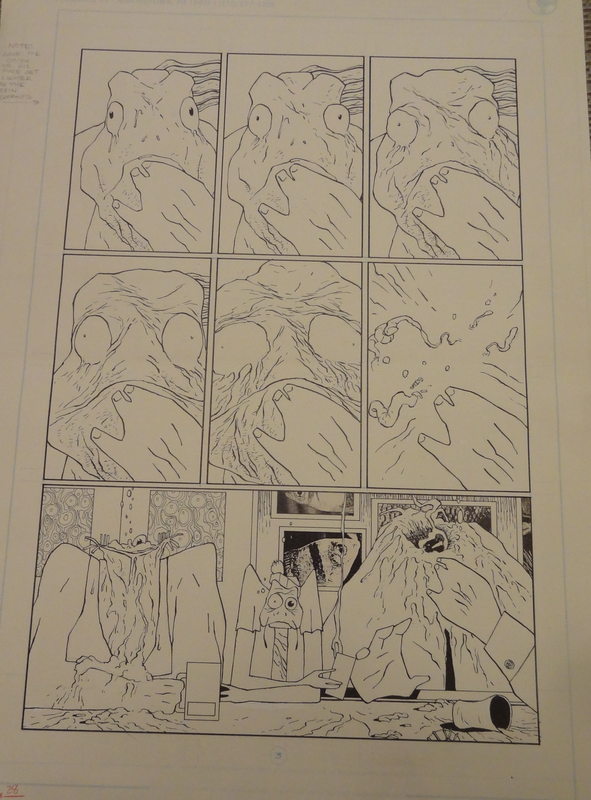 This page is from a short in the Fish Police. You’ll notice Inspector Gill stuck in a bar between two headless men. I have a special place in my heart for Steve Moncuse’s The Fish Police. I might have been sitting there late one Saturday might drinking and watching SCTV when one of us yelled, “Holy Mackerel!!! It’s the Fish Police! !” I’m pretty sure it wasn’t me. Steve never parted with his originals in those days, so I settled for one of the guest artists. 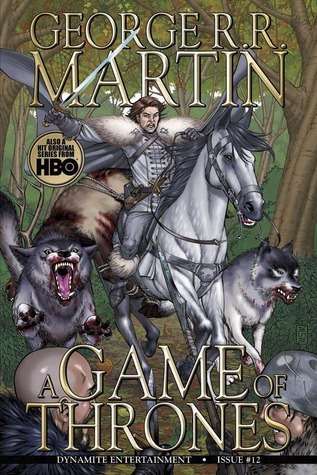 I may need to pick up the run of Game of Thrones comics. I’m also a huge Daniel Abraham fan, so I feel bad that I haven’t read these. While I’ve not read them, I do keep abreast of the covers. Michael Miller does a fabulous job with the covers and postes them regularly on his FaceBook page – Art of Ice and Fire. You might recognize the background of my blog as one of his covers. His work captures the look and feel of Martin’s imagination in fantastic detail. Needless to say, I think he is great. 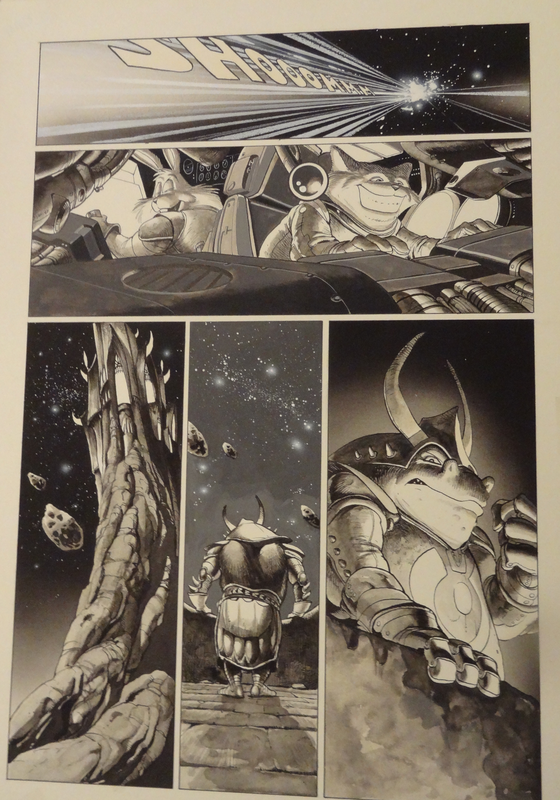 I became a fan of Mike’s when he did the comic interpretation of The Hedge Knight. What? You haven’t read The Hedge Knight, The Sworn Sword or The Mystery Knight? You don’t know Dunk and Egg? These are Westeros stories that are set about 80 years before A Game of Thrones. Not only do they provide clues to mysteries and questions we have about Westerosi history, they are great stories on their own. Mike drew the art for the comic versions of the first two. 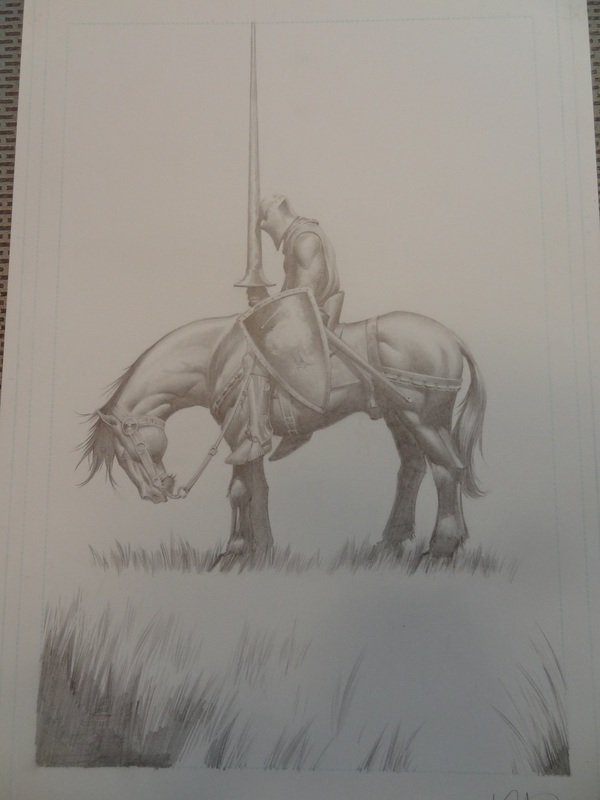 Here’s some art from The Hedge Knight. 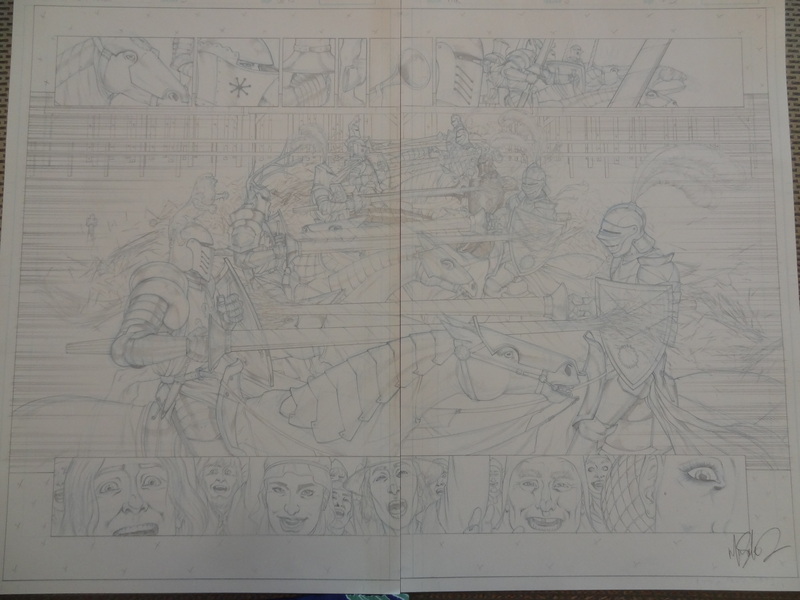 In both of those double page pieces, Mike uses composition to make the pieces really sing. 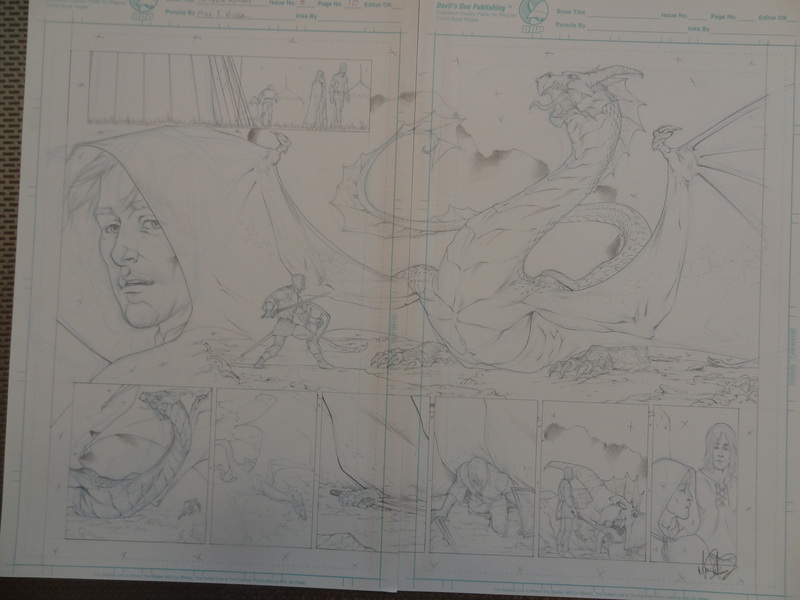 The dragon flowing out of the cowl is very reminiscent of pieces Neal Adams drew in his Ben Casey strip. And who doesn’t want to be compared to Neal Adams? The tournament piece highlights the speed and clash of steel that happens. Mike takes the approach of book-ending the violence with the knights’ prelude to contact and the blood lust of the cheering crowd. This composition helps to make these pages stand out. 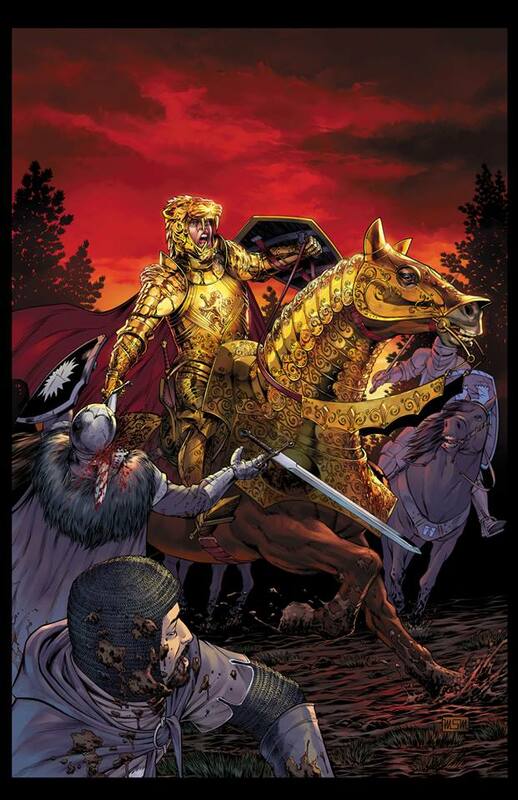 I really like the cover of Dunk sitting melancholy on his horse, echoing Frank Frazetta’s Death Dealer. Growing up, Frazetta was the premier fantasy artist. Seeing Mike’s homage the first time made me happy on multiple levels; both nostalgic and present. As a side note, can I get a show of hands for those of you that have a copy of Molly Hatchet’s Flirting with Disaster and just had the “a ha” moment? I have really liked the covers Mike has done for the comic. Clearly you know I like the one I use as a background on this blog, as well as the other ones above. He does such a great job of conveying both grand fantasy and nuanced detail. It has been fun watching a very good artist continue to grow and be come a great artist. 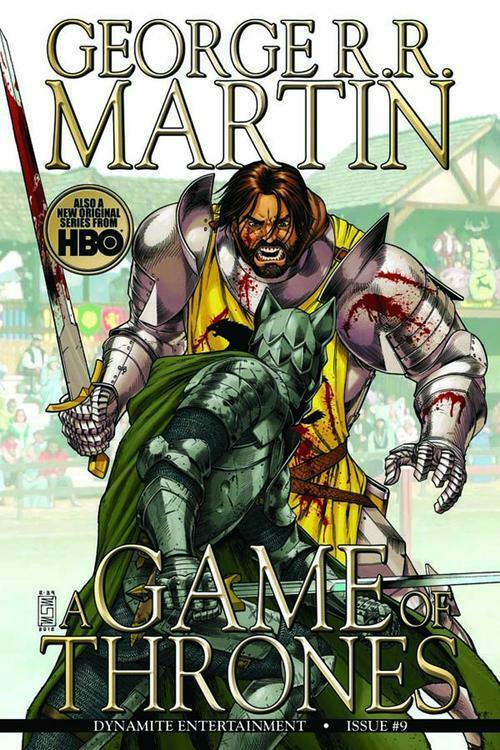 In the cover below, look at how much work went into the Hound’s chain mail. Combining that with the well crafted rage in the Mountain’s expression is fantastic. Check out the detail on the Hound’s chain mail! Michael’s latest piece is stunning. Of course it doesn’t hurt that he has a dynamite colorist adding drama to the finished piece. In his latest cover, the Kingslayer, Jaime Lannister is bearing down on several unfortunate Northmen. I thought the detail on the Hound’s chain mail was exquisite. Then I saw Jaime’s armor and his horse’s plating. Especially exquisite is the details on the coward at the bottom of the cover. I think he really got that guy’s goatee and nose right! What really got me is that the character, though unnamed, is Me!. Seriously. I had joked with Mike previously about drawing me into a crowd shot. If I estimate correctly, my face will peek out between the “G” “H” and “R” on the cover. If only I could use those superimposed letters to hide from certain doom at the hands of the greatest warrior in Westeros. recognize the guy in the bottom left? Look at me prepare to die in the mud like the sniveling coward I am. Maybe I can be resurrected and be a blue lipped warlock in A Clash of Kings.